The market had a big week with the model starting at -85 and ending the week at -94. The market is still under pressure, as expected and signaled by the deeply negative spread score. You ignore risk spreads at your peril. Scores now as negative as at depths of 2015,’11 and ‘08. 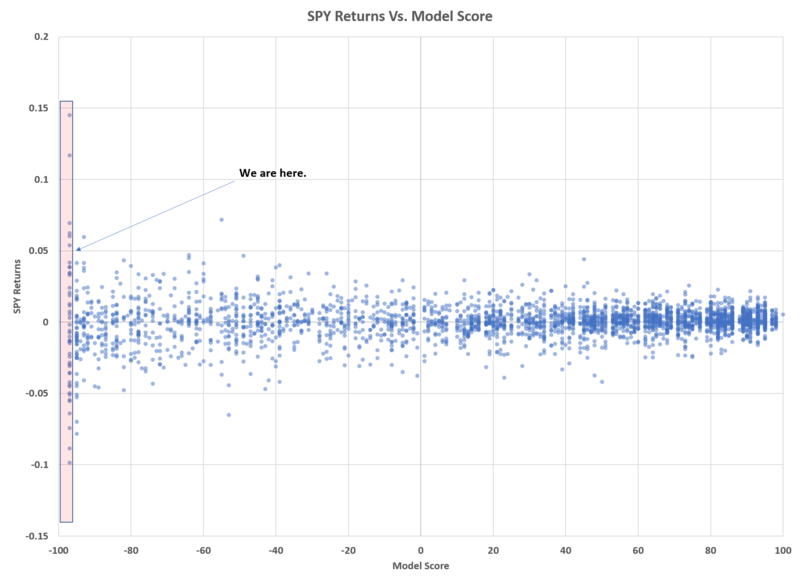 Another way of understanding what can be expected with such a negative model score is a scatter plot between model score and SPY 1 day returns. When the model score is high we can see many small positive returns clustering where all returns with model scores above 0 are contained in the -5% to +5% range – when the model score is above 50 we barely see any +-2% days . When the model score is low we see many a much wider range of 1 day returns indicating non clustering and erratic swings (-10% to +15%). This is not to be taken lightly. The X axis is the model score (bottom) and the Y axis is SPY returns (left). Alpha of .5 has been applied to the scatter plot dots so as to show where clusters lie. Individual shares have been pummeled and some very bad damage has been done to a variety of leading shares that have been flying high. I encourage you to work with the Database to see if your portfolio needs to be changed in composition. High quality shares are likely to outperform high beta names. The name of the game is still changed from Growth to Capital Preservation. Merry Christmas and a Happy New Year! – we look forward to an exciting 2019 tackling the markets with you. Risk model has performed v well this month (i.e. avoided buying into weakness), bravo old chap. Hi James, the model is trend following, therefore it will NEVER buy into weakness. You have to differentiate between MARKET weakness and risk spread weakness. The two are NOT the same. It is quite possible for risk spreads to remain positive and the market to be weak. That is an indication that the market will eventually rally. That is what happened in February this year. But now, we are in a different period altogether. You should use the model’s ability to raise cash/position defensively at crucial times to work with the Database and choose individual shares to buy when all around you are selling them for peanuts.